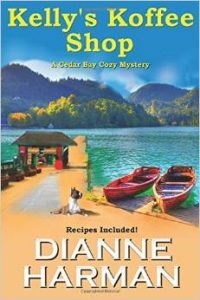 Dianne Herman is the author of three Cedar Bay Cozy Mysteries set along the central coast of Oregon. Kelly’s Koffe Shop is the first in the series. The book’s central character is Kelly Connor, a fifty-something breakfast, and luncheonette owner of the popular Kelly’s Koffe Shop. One of her waitresses is her goddaughter, Amber Cook, found dead and tied down by weights in the nearby bay. Kelly is determined to find out who murdered Amber for her best friends and Amber’s parents, Bob and Ginger. Her boyfriend Mike – who is also the town sheriff – is pleased to have her help. Especially since Kelly is someone, many Cedar Bay residents feel more comfortable confiding in, then they do with him. Whether she is at the shop or out investigating, her boxer Rebel is keeping her safe. In many ways, the book makes me think of the 1980s television series Murder She Wrote. Like Jessica Fletcher, Kelly is someone who likes to seek justice by getting to the bottom of a mystery. The book is not long at all – 138 pages and does not include five pages of meal recipes featured in the book. I did like the book quite a bit. 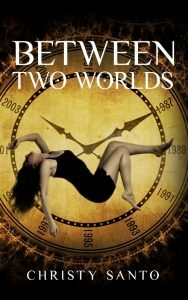 However, there were times when too much explanation took away my ability to make inferences of my own as I read the book. I think I may give another book in the series a go and see if there are less explanation and more room for me – the reader – to do some guess work.